You have probably heard about Company Towns, built by the huge businesses to house their employees. 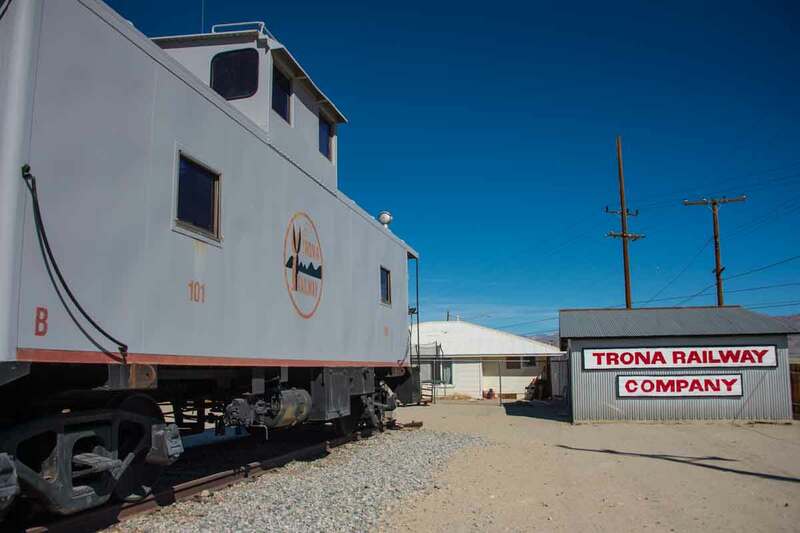 This little town of Trona has a long and varied history. Borax was discovered by John Searles in the 1860's while he was looking for gold. 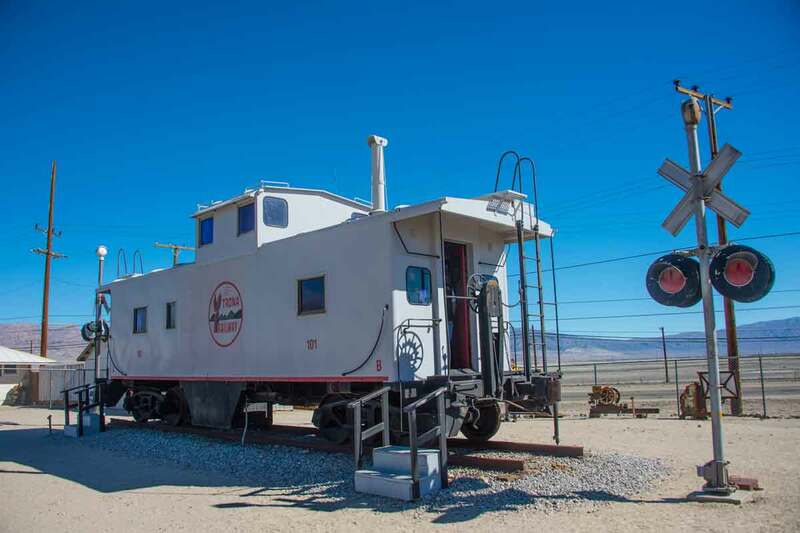 He started up the San Bernadino Borax Mining Company, hauling product by 20 mule teams to Southern California. Later he sold out to Francis Smith, the Borax King. 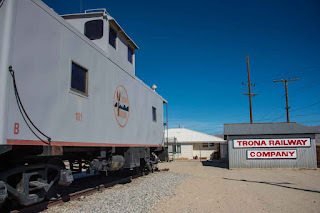 In 1913, the American Trona Company was set up by Consolidated Gold Fields out of South Africa. They built the railroad and began production of potash in 1915. If you were a company executive, you got company housing. I have to admit, these homes are VERY well built, each having a huge tin roof covering a large wrap-around porch. Most of the homes now have enclosed porches, rather ruining the original appeal of the structure. Mexican employees were required to live in a separate section across the tracks from the plant. Construction workers were relegated to tent living somewhere in between. It appears they are all two bedroom homes with a nice galley kitchen, lots of built in storage and high ceilings. I assume that is because it was really hot in the desert and there was no such thing as air conditioning. They had a large bathroom, this one having been slightly remodeled. As time went on, the Company built guest quarters and various buildings to be occupied by businesses. One long building, now demolished, held a clothing store, the types of businesses to keep their employees happy. 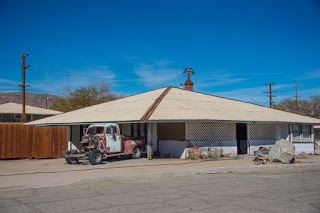 After World War II, their Latino employees gained a foothold and were finally allowed to purchase homes in the upper section, but only when those homes became available through attrition. In 1974, the entire lake, land, railroad and buildings, were purchased by Kerr-McGee. Not wanting to be strapped with the company town, they sold it off piece by piece to employees who wanted to own their homes. Then they had massive layoffs and cut production by half. Although it has had several more owners since, the town has never recovered. Property prices being what they are, houses don't sell, and so are rented out to very low income people. A sad ending to an amazing little town. Production continues today as brine is pumped from below the lake and processed using evaporation methods. But WAIT ..... there's much more to see, as our 93 year old hostess took us out back to the Caboose Museum. 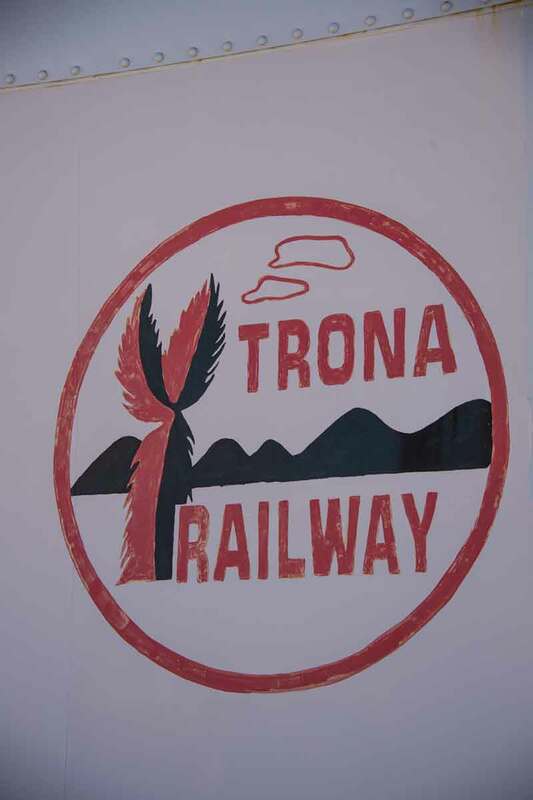 Trona Railway donated this beautiful example in excellent condition. By the way, the trains still run the same route as they did back in the heyday of potash. But WAIT!!!! There's even ANOTHER railroad museum at the back in this little building. The scales used by the railway company to weigh things can be seen, along with lots of office equipment and other paraphernalia. As we tried to leave, we were asked to come back one more time to the FIRE museum. I've never seen so many little museums in such a tiny town. 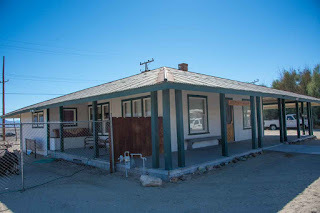 We declined however, since we had a 2:00 appointment at the new Naval Weapons Museum in Ridgecrest. That will be part of tomorrow's story. By now we are all starving, so we headed out to Casa Corona ... fine Mexican cuisine. It WAS pretty good food, but the place was so full of people and so loud you could hardly hear yourself think. 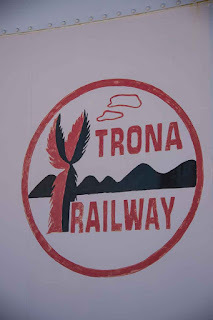 And so we leave Trona for the hike to see the petroglyphs. If you're ever here during the fall or spring, be sure and make a reservation for this one. The hike is not nearly as bad as they say and the sights are just fascinating. Cool videos! The main problem with the mules was they had to carry hay and water for them, both weighing more than the borax! So much interesting history for such a small town, thanks for the info. Definitely an eye opener. I've known the Ridgecrest area all my life but never knew about the borax. This post reminded me of when we visited Pullman, Illinois, another railroad company town--now just another neighborhood in Chicago. Fascinating history of when our country was in an economic boom. McCloud California (southern foot of Mt. Shasta) is a old company owned town for logging, and associated with the McCloud Railroad. I think they have a population of 1,000, but there are still some of the old company homes and buildings there, including lots of railroad stuff...very interesting. Sounds like a cool town to visit. I'm getting emails too, but only to my junk mail. Can't seem to get them to go to my In-Box. That is an interesting little town and thank you for the tour. The homes 'were' quite nice for the workers. Too bad they went downhill afterwards. It's sad to see all those really nice homes going to waste as cheap rentals.